Infections sustained by multidrug-resistant (MDR) and pan-resistant Acinetobacter baumannii have become a challenging problem in Intensive Care Units. Tigecycline provided new hope for the treatment of MDR A. baumannii infections, but isolates showing reduced susceptibility have emerged in many countries, further limiting the therapeutic options. Empirical combination therapy has become a common practice to treat patients infected with MDR A. baumannii, in spite of the limited microbiological and clinical evidence supporting its efficacy. Here, the in vitro interaction of tigecycline with seven commonly used anti-Acinetobacter drugs has been assessed. Twenty-two MDR A. baumannii isolates from Intensive Care Unit (ICU) patients and two reference strains for the European clonal lineages I and II (including 3, 15 and 6 isolates that were resistant, intermediate and susceptible to tigecycline, respectively) were tested. Antimicrobial agents were: tigecycline, levofloxacin, piperacillin-tazobactam, amikacin, imipenem, rifampicin, ampicillin-sulbactam, and colistin. MICs were determined by the broth microdilution method. Antibiotic interactions were determined by chequerboard and time-kill assays. Only antibiotic combinations showing synergism or antagonism in both chequerboard and time-kill assays were accepted as authentic synergistic or antagonistic interactions, respectively. Considering all antimicrobials in combination with tigecycline, chequerboard analysis showed 5.9% synergy, 85.7% indifference, and 8.3% antagonism. Tigecycline showed synergism with levofloxacin (4 strains; 16.6%), amikacin (2 strains; 8.3%), imipenem (2 strains; 8.3%) and colistin (2 strains; 8.3%). Antagonism was observed for the tigecycline/piperacillin-tazobactam combination (8 strains; 33.3%). Synergism was detected only among tigecycline non-susceptible strains. Time-kill assays confirmed the synergistic interaction between tigecycline and levofloxacin, amikacin, imipenem and colistin for 5 of 7 selected isolates. No antagonism was confirmed by time-kill assays. 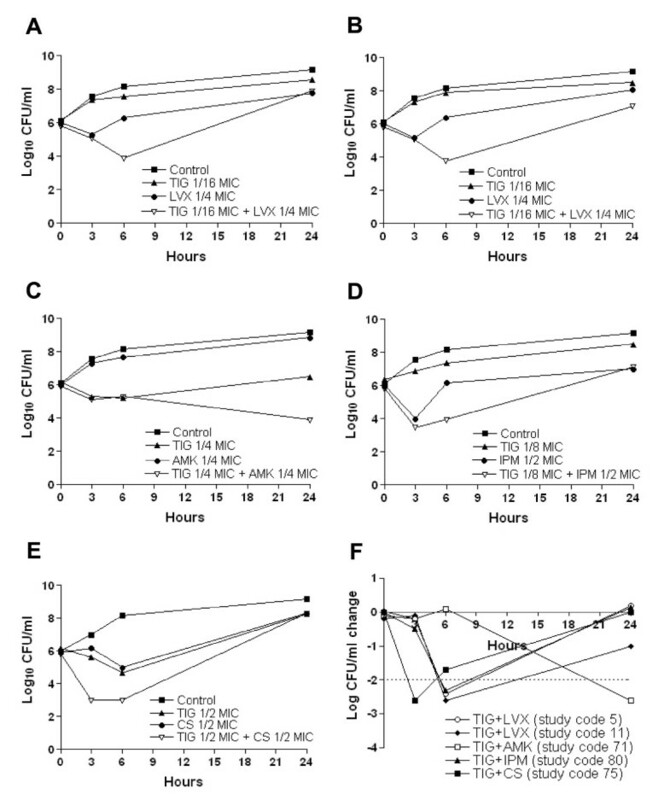 This study demonstrates the in vitro synergistic activity of tigecycline in combination with colistin, levofloxacin, amikacin and imipenem against five tigecycline non-susceptible A. baumannii strains, opening the way to a more rationale clinical assessment of novel combination therapies to combat infections caused by MDR and pan-resistant A. baumannii. Acinetobacter baumannii has emerged as a leading nosocomial pathogen, particularly in Intensive Care Units (ICUs), where several outbreaks have been described . The epidemic potential and the clinical severity of A. baumannii infections are primarily related to the propensity of this organism to develop resistance to a variety of antimicrobial agents, including broad-spectrum beta-lactams, aminoglycosides, fluoroquinolones and carbapenems . Carbapenems remain drugs of choice for the treatment of A. baumannii infection, but their efficacy can be compromised by the spread of novel class D carbapenemases [3, 4]. As a result, carbapenem-intermediate or -resistant A. baumannii isolates are becoming increasingly prevalent in several countries . Colistin, an old antibiotic from the polymixin group, is very effective against multidrug-resistant (MDR) A. baumannii isolates, but the emergence of resistance has occasionally been experienced . Moreover, unfavourable pharmacokinetic properties and possible adverse effects restrict its clinical use [7, 8]. Tigecycline, a new semi-synthetic tetracycline, has provided hope for the treatment of A. baumannii infections, including carbapenem-resistant isolates [9, 10]. However, A. baumannii isolates showing reduced susceptibility to tigecycline have recently been identified in Israel , Spain , Italy , USA , and China . Moreover, the exposure to sub-MIC tigecycline concentrations has been shown to facilitate the development of resistance in A. baumannii both in vitro and in vivo [16–18]. In this scenario, combination therapy has become the ultimate resource to treat MDR and pan-resistant A. baumannii infections , but its actual efficacy is unclear from a microbiological and clinical viewpoint. Previous investigations revealed an overall indifferent effect of tigecycline in combination with other antimicrobial agents commonly used against Acinetobacter spp., including carbapenems, fluoroquinolones, rifampicin, ampicillin-sulbactam, piperacillin-tazobactam, polymyxin B and colistin [20–22]. Only few clinical studies reported successful in vivo treatment of MDR A. baumannii infection with tigecycline in combination with colistin, meropenem, piperacillin-tazobactam and cotrimoxazole [23, 24]. However, these results were not supported by an in vitro synergy study. Recently, tigecycline/amikacin synergistic interactions have been observed in vitro [22, 25], but rarely in case of carbapenem-resistant A. baumannii strains . The aim of this study was to investigate the in vitro activity of tigecycline in combination with a variety of commonly used antimicrobial agents against MDR A. baumannii isolates, including tigecycline intermediate and resistant strains. Part of this work has been presented at the 48th ICAAC meeting, Washington DC (USA), 2008 (Poster C1-3817). Twenty-two A. baumannii isolates were selected from a well-characterized set of MDR A. baumannii isolates collected in the period January 2004–June 2005 from the ICU of 7 general hospitals of the Rome (Italy) urban area [13, 26]. Twenty A. baumannii isolates were obtained from clinical specimens of ICU patients, and 2 were recovered from the ICU environment (Table 1). None of the patients underwent previous treatment with tigecycline. The collection also comprises an index strain (study code 115, also called ACICU) from an ICU outbreak , whose complete genome has recently been sequenced . The two prototypic strains for the epidemic European clonal lineages I (RUH875) and II (RUH134) were included as reference . The selection criteria for A. baumannii isolates were based on hospital of origin (representing 7 hospitals, named A to G, in the Rome urban area), tigecycline susceptibility (6 sensitive; 15 intermediate; 3 resistant), molecular type (RAPD fingerprint, pulsotype and sequence group as described)  and antibiotic resistance profile (Table 1). Since there is no widely accepted definition for MDR A. baumannii, , hereafter we shall refer to the MDR phenotype as diminished susceptibility to ≥ 2 of the following drug classes: antipseudomonal cephalosporins, antipseudomonal carbapenems, β-lactam-β-lactamase inhibitor combinations, antipseudomonal fluoroquinolones and aminoglycosides, according to ref. . Twenty-one isolates were genetically related to either the European clonal lineage I (6 isolates) or II (15 isolates), and indicated as type 2 or 1, respectively, upon sequence group analysis, RAPD, and pulsotyping. Typing data have been published elsewhere . In addition, 3 A. baumannii isolates (study codes 50, 75 and 105) showing a variant molecular type were included. Isolates belonging to RAPD types 1, 1a and 4 were resistant to carbapenems, while those belonging to RAPD types 2 and 2a were susceptible (Table 1). a Data are from refs [13, 26]. b Isolates showing an intermediate level of susceptibility were classified as resistant. c A. baumannii index strain, also called ACICU [27, 28]. d Representative of the European clonal lineages I (RUH 875) and II (RUH 134) . Antimicrobial agents were: levofloxacin, piperacillin-tazobactam, amikacin, imipenem, rifampicin, ampicillin-sulbactam, colistin, and tigecycline. MIC determinations for all antibiotics were performed by the broth microdilution method, according to the Clinical and Laboratory Standards Institute (CLSI) protocol . All powders were obtained from the Sigma-Aldrich (Milan, Italy), except tigecycline (Wyeth-Ayerst, Collegeville, Pennsylvania, USA). MICs were determined in 96-well microtiter plates (Costar, Cambridge, Massachusetts, USA) containing freshly prepared Mueller-Hinton broth (Oxoid, Milan, Italy), to prevent oxidative degradation of tigecycline in aqueous solution (Wyeth Research, unpublished data). The inoculum was adjusted to ~5 × 105 CFU/ml in a 100-μl final volume, and microtiter plates were visually read after incubation for 24 h at 37°C. Escherichia coli ATCC 25922 and Staphylococcus aureus ATCC 29213 were used as internal quality control strains. The US FDA breakpoints approved for Enterobacteriaceae were applied to define tigecycline susceptibility (susceptibility, ≤ 2 mg/L; resistance, ≥ 8 mg/L). MIC results were interpreted according to the CLSI breakpoint criteria . The criteria proposed by Gales et al were used for interpretation of colistin susceptibility . Breakpoints for rifampicin were interpreted according to Hogg et al . Antibiotic interactions were determined using the chequerboard assay as previously described . The range of drug concentration used in the chequerboard analysis was such that the dilution range encompassed the MIC for each drug used in the analysis. Broth microdilution plates were inoculated with each A. baumannii isolate to yield ~5 × 105 CFU/ml in a 100-μl final volume, and incubated for 18 h at 37°C. Synergy has been defined as requiring a fourfold reduction in the MIC of both antibiotics in combination, compared with each used alone, measuring the fractional inhibitory concentration index (FICI). The FICI was calculated for each combination using the following formula: FICI = FICA + FICB, where FICA = MIC of drug A in combination/MIC of drug A alone, and FICB = MIC of drug B in combination/MIC of drug B alone. The FICI was interpreted as follows: synergy, FICI ≤ 0.5; indifference, 0.5 < FICI ≤ 4; antagonism, FICI > 4 . Tubes containing freshly prepared Mueller-Hinton broth supplemented with the drug were inoculated with A. baumannii isolates to a density of ~5 × 105 CFU/ml in a final volume of 10 ml and incubated in a shaking bath at 37°C. Aliquots were removed at time 0, 3, 6, and 24 h post-inoculation, and serially diluted in saline for determination of viable counts. Diluted samples (100 μl) were plated on Mueller Hinton agar plates and bacterial counts were determined after 18-h incubation at 37°C. The antibiotic concentrations used in time-kill assays corresponded to 0.5-, 1-, and 2-fold the MIC values in combination as determined by the chequerboard method, i.e. 2- to 16-fold lower than the MIC of each antibiotic alone (see Results). The bactericidal activity was defined as = 3 log10 CFU/ml reduction in the colony count relative to the initial inoculum . Synergy was interpreted as ≥ 2 log10 decrease in CFU/ml by the drug combination when compared with its most active constituent, and = 2 log10 decrease in the CFU/ml below the initial inoculum, at any time point. The drug combination was considered to be antagonistic for = 2 log10 increase in CFU/ml and indifferent for < 2 log10 change in CFU/ml . All synergistic interactions were confirmed by triplicate assays. Only antibiotic combinations showing synergism or antagonism in both chequerboard and time-kill assays were accepted as authentic synergistic or antagonistic interactions, respectively. This was performed essentially as described by Miller et al. . Approximately 108 cells from overnight cultures in Mueller-Hinton broth were spread onto triplicate Mueller-Hinton agar plates supplemented with the selective antibiotic at a concentration that was four-fold higher than the respective MIC for an individual isolate. After 48 h incubation at 37°C, the number of colonies was counted, and mutation frequencies were expressed as the mean number of colonies recovered as a fraction of total viable bacteria plated. Isolates with mutation rates >10-7 were considered to be mutators . The presence of adeB, adeJ, adeE, and adeY, and of the two-component regulatory system adeRS which controls AdeABC expression was investigated by PCR as previously reported [37–39]. The identity of adeB, adeJ, adeR, and adeS amplicons was confirmed by direct DNA sequencing. The antibiotic susceptibility levels, expressed as MIC of levofloxacin, piperacillin-tazobactam, amikacin, imipenem, rifampicin, ampicillin-sulbactam, colistin and tigecycline, were preliminarily determined for the whole panel of 24 A. baumannii isolates [see Additional file 1]. All isolates, except the prototypic strains for the European clonal lineages I (RUH 875) and II (RUH 134), were resistant to levofloxacin and piperacillin-tazobactam (22 isolates each, 91.7%). A high percentage of isolates were resistant to amikacin (18 isolates, 75.0%), imipenem (15 isolates, 62.5%), and rifampicin (18 isolates, 75.0%), while only 9 (37.5%) and 1 (4.2%) isolates were resistant to ampicillin-sulbactam and colistin, respectively. Eighteen isolates (75.0%) were non-susceptible to tigecycline, including both resistant and intermediate phenotypes. Reference strains RUH 875 and RUH 134, isolated in early 1980s, showed an overall susceptible profile (Tables 1 and Additional file 1). Chequerboard analysis performed with all antimicrobials in combination with tigecycline showed 5.9% synergy, 85.7% indifference, and 8.3% antagonism (Table 2). Tigecycline exerted synergistic activity with levofloxacin (4 isolates), amikacin, imipenem and colistin (2 isolates each). Notably, synergistic effects were observed only among tigecycline non-susceptible isolates (Table 2). Antagonistic interactions were frequently observed for tigecycline/piperacillin-tazobactam (8 isolates), and to a lesser extent for tigecycline/amikacin (3 isolates), tigecycline/colistin, tigecycline/ampicillin-sulbactam and tigecycline/rifampicin (1 isolate each) (Table 2). The concentration of individual drugs in synergistic combinations is shown in Table 3.
a Synergistic and antagonistic interactions are in bold and italics, respectively. b The FICI value of the tigecycline/colistin combination has been calculated considering a MIC value of 32 mg/L for colistin [see Additional file 1]. c FICI value of tigecycline in combination with levofloxacin and imipenem has been calculated considering a MIC value of 0.125 mg/L for both levofloxacin and imipenem [see Additional file 1]. a Breakpoint criteria are provided in Additional file 1. All synergistic interactions inferred from chequerboard analysis were reassessed by time-kill kinetic experiments performed with tigecycline in combination with levofloxacin, amikacin, imipenem and colistin. Time-kill diagrams for effective combinations are shown in Figure 1. Five of 10 synergistic combinations, namely tigecycline/levofloxacin (2 out of 4 isolates), tigecycline/amikacin, tigecycline/imipenem and tigecycline/colistin (1 out of 2 isolates each) were confirmed. Synergistic effects were observed at 3 h for tigecycline/colistin (2/0.25 mg/L = 1/2 MIC for both antibiotics), at 6 h for tigecycline/imipenem (0.5/16 mg/L = 1/2 MIC for tigecycline and 1/8 MIC for imipenem) and tigecycline/levofloxacin (0.25/4 mg/L = 1/16 MIC for tigecycline and 1/4 MIC for levofloxacin), and at 24 h for tigecycline/amikacin (1/64 mg/L = 1/4 MIC for both antibiotics). Re-growth was observed after 24 h for tigecycline/colistin, tigecycline/imipenem and tigecycline/levofloxacin combinations (Figure 1). No synergistic combination resulted in bactericidal activity. Moreover, none of the 14 antagonistic interactions inferred from chequerboard analysis was confirmed by time-kill assays (data not shown). Time-kill kinetics for confirmed synergistic interactions. (A) TIG/LVX, study code 5; (B) TIG/LVX, study code 11; (C) TIG/AMK, study code 71, (D) TIG/IPM, study code 80; (E) TIG/CS, study code 75; (F) Comparison of quantitative change in CFU/ml, relative to the most active constituent, for the synergistic interactions. The drug concentrations are as follows: TIG/LVX, 0.25 and 4 mg/L, respectively (study codes 5 and 11); TIG/AMK, 1 and 64 mg/L, respectively (study code 71); TIG/IPM, 0.5 and 16 mg/L, respectively (study code 80); TIG/CS, 2 and 0.25 mg/L, respectively (study code 75). The dotted line denotes the threshold value to define synergy. Panels show one representative experiment of three replicates. To determine if regrowth in time-kill assays was due to A. baumannii hypermutability, the spontaneous mutation frequency toward antibiotic resistance was determined for isolates showing regrowth at 24 h (study codes 5, 11, 75, 80) or not (study code 71). Resistant mutants were not detected (mutation rate <10-8) upon selection with levofloxacin, amikacin, imipenem, and colistin at four-fold the MIC, while tigecycline-resistant mutants generated with a frequency between 1.2 × 10-8 and 9.0 × 10-8 for all tested isolates (see Additional file 2). Search for efflux genes showed that all isolates were positive for the adeB and adeJ genes and negative for both adeE and adeY genes, irrespective of their resistance or susceptibility profile. All of the isolates were positive for the two-component regulatory system adeRS. In this work we investigated tigecycline interactions with various antimicrobials by a two-step approach, involving preliminary chequerboard screening and subsequent time-kill assays. The chequerboard is an easy to perform, high-throughput method which provides single time-point evidence of bacterial growth inhibition, and generally results in an overestimate of synergistic interactions . For these reasons, all effective combinations inferred from chequerboard analysis were reassessed by time-kill assays. Although time consuming and cumbersome, the time-kill assays provide a dynamic picture of antibiotic action over time . Hence, only combinations showing synergy in both assays were interpreted as authentic synergistic interactions. While chequerboard screening provided synergistic results for the combinations tigecycline/levofloxacin, tigecycline/amikacin, tigecycline/imipenem and tigecycline/colistin in 7 out of 24 isolates, time-kill kinetics confirmed synergism in only 5 out of 7 isolates, 4 of which were resistant to carbapenems and belonged to type 1 (related to the European clonal lineage II) . The different synergistic activities observed in A. baumannii isolates sharing the same epidemiological type  probably reflect the variable expression of different resistance determinants. This poses the need to test synergistic interactions even in case of clonal isolates characterized by identical genetic fingerprint and resistance profile. Three out of five tigecycline synergistic concentrations observed in this study with time-kill assays exceed the maximum plasmatic concentration of tigecycline (0.38 mg/L) achievable with a standard dosage . However, thanks to its pharmacodynamic properties, tigecycline is rapidly distributed into tissues resulting in up to 78-fold higher tissue concentrations, compared to plasma [42, 43]. These considerations suggest a clinical usefulness for some of the synergistic combinations here detected for tigecycline. We identified one isolate (study code 71) showing tigecycline/amikacin synergistic interaction at 24 h (1 and 64 mg/L for tigecycline and amikacin, respectively). This strain was resistant to amikacin (MIC = 256 mg/L) and showed an intermediate resistance to tigecycline (MIC = 4 mg/L). Although the synergistic concentration for amikacin (64 mg/L) is significantly above the threshold achievable in clinical treatments with a multi daily dosing regimen (20–30 mg/L), higher concentrations (65–75 mg/L) can be achieved with a single amikacin daily dose . In vitro synergistic interactions between tigecycline and colistin have previously been demonstrated by time-kill assays in Klebsiella pneumoniae  and in vivo for the treatment of a severe case of MDR Pseudomonas aeruginosa osteomyelitis . Although several studies have reported clinical efficacy of colistin [7, 8], the synergistic effect of tigecycline/colistin combination has never been demonstrated in A. baumannii by time-kill analysis. Here, we showed for one A. baumannii isolate (study code 75) a synergistic effect at 3 h of incubation for tigecycline/colistin combination (2 and 0.25 mg/L for tigecycline and colistin, respectively), with a subsequent re-growth within 24 h. This strain was susceptible to colistin (MIC = 0.5 mg/L) and intermediate resistant to tigecycline (MIC = 4 mg/L). Notably, the colistin synergistic concentration is significantly below the serum concentration achievable after standard dosing regimen (5–6 mg/L) [44, 47]. As noted by various authors [48–50], colistin causes permeabilisation of the bacterial outer membrane, which would allow enhanced penetration by and activity of the other antibiotic in combination. The tigecycline/colistin synergistic interaction could therefore have an impact in clinical practice by reducing the therapeutic dosage of colistin, and hence the risk of collateral effects which currently represent a major limitation to its clinical use [7, 8]. We also demonstrated a synergistic interaction for the combination tigecycline/imipenem (0.5 and 16 mg/L for tigecycline and imipenem, respectively) in one A. baumannii isolate (study code 80), belonging to the epidemic type 1, and carrying the blaOXA-58 gene . It is of note that the serum concentration achievable during imipenem treatment is 20 mg/L . Thus, the synergistic interaction tigecycline/imipenem, which has never been described before for A. baumannii, could represent a valid therapeutic option to combat the increasingly frequent A. baumannii isolates resistant to both these drugs. Resistance to quinolones is widespread among MDR A. baumannii strains . In this study, a high percentage of A. baumannii isolates were resistant to levofloxacin as a single agent. Here we report for the first time a synergistic interaction between tigecycline and levofloxacin (0.25 and 4 mg/L respectively) for 2 A. baumannii isolates, at 6 h of incubation. These strains showed full resistance to levofloxacin (MIC = 16 mg/L) and intermediate resistance to tigecycline (MIC = 4 mg/L). Also in this instance, the levofloxacin synergistic concentration is below the maximum serum concentration (5.9 mg/L) . Even if no undesirable antagonistic combinations were confirmed in this study by time-kill assay, we detected a decreased antimicrobial efficacy for the tigecycline/piperacillin-tazobactam combination, compared to the antimicrobial efficacy of piperacillin-tazobactam alone (data not shown). This result is worrying considering that tigecycline/piperacillin-tazobactam combination therapy is often given empirically, without the support of in vitro interaction assays. The molecular mechanisms of synergy between tigecycline and the various antibiotics deserve further investigation. Overexpression of the AdeABC efflux pump has been demonstrated in tigecycline resistant A. baumannii isolates , and our results indicate that all A. baumannii isolates tested carry the adeABC/adeIJK genes, suggesting that their variable expression level – but not their presence per se – could contribute to the extent of resistance. We also showed that adeDE is not present in A. baumannii, in agreement with previous studies [38, 39]. The regrowth after 24 h observed in time-kill experiments for all confirmed synergistic combination, except for tigecycline/amikacin, could reflect the labile nature in solution of tigecycline due to oxidative degradation (Wyeth Research, unpublished data) and/or the tendency of A. baumannii strains to induce resistance on exposure to antimicrobial agents, especially at sub-MIC concentrations. At present, we are unable to check the tigecycline levels and therefore we cannot determine if tigecycline was degraded, at least partially, during the experimental time course. Determination of mutation frequencies for resistance to levofloxacin, amikacin, imipenem, colistin, and tigecycline at four-fold the MIC failed to detect any hypermutator phenotype for all isolates showing synergy in time-kill assays, irrespective of regrowth. Moreover, the mutation frequency toward resistance to tigecycline (~5 × 10-8) or other antibiotics (<10-8) is incompatible with the observed regrowth kinetics (Figure 1). Hence, we can only speculate that regrowth was due to different response of isolates to antibiotic-induced overexpression of broad-specificity multidrug efflux systems, like AdeABC and AdeIJK [16, 37–39], rather than hypermutability. According to this hypothesis, the tigecycline/amikacin interaction may have prevented the expression of efflux-based resistance by a still undefined mechanism, ultimately resulting in more effective synergism. In fact, a recent study on tigecycline/amikacin synergistic interactions in A. baumannii demonstrated the suppression of regrowth at 24 h for this particular antibiotic combination, in full agreement with our findings . Further studies are needed to elucidate the molecular mechanisms responsible for synergistic interactions with tigecycline and to explore their therapeutic potential. It will also be necessary to combine in vitro findings with additional pharmacokinetic and pharmacodynamic data in order to provide more meaningful prediction of the in vivo efficacy of synergistic combinations in clinical practice. Lastly, in vitro synergy testing of tigecycline combinations is recommended prior to starting any combined therapy for treatment of infections sustained by MDR and pan-resistant A. baumannii. Wyeth-Ayerst (Collegeville, Pennsylvania, USA) kindly provided laboratory-grade tigecycline. This research was supported by the INMI "L. Spallanzani" – Ricerca Corrente 2007 grant to P.V. LP and SD performed the susceptibility tests, the molecular genetics studies and drafted part of the manuscript. AC participated in the design of the study, provided clinical interpretation of susceptibility data, and drafted part of the manuscript. NP and PV conceived of the study, participated in its design and coordination, and critically revised the draft manuscript. All authors read and approved the final manuscript.